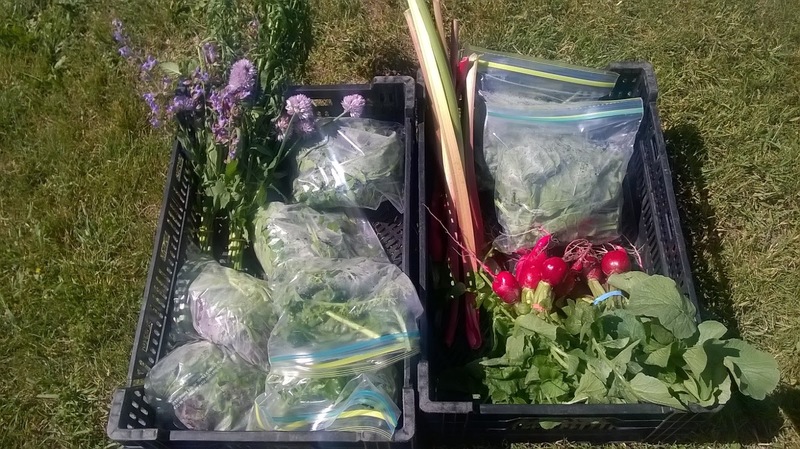 We will be attending the Portland Farmers Market from 8 Am-12 Pm on Saturday at the Old Red Mill on Water Street where we will also have these products available, as well as more fresh cut herbs, potted herbs, and vegetable and fruit transplants. 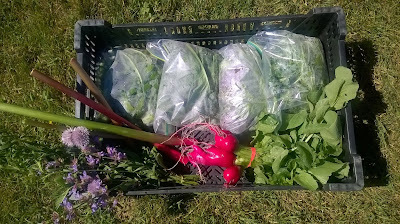 1 bunch radishes, 4 stalks rhubarb, 1 bunch herbs. New this week, this spring favorite can be eaten many different ways. Our favorite is with lots of sugar and baked into a strawberry rhubarb pie! There are also many great muffin and scone recipes which you can use rhubarb in. Others will eat the stocks with some salt raw. If you are feeling real ambitious you can even pickle rhubarb. We have a mix of some of our more unusual greens this year. 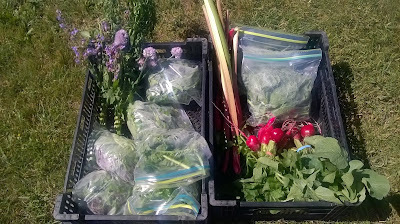 Young beet greens, and spicy mustard, mizzuna and tatsoi greens. This is great by itself or mixed with the lettuce mix. 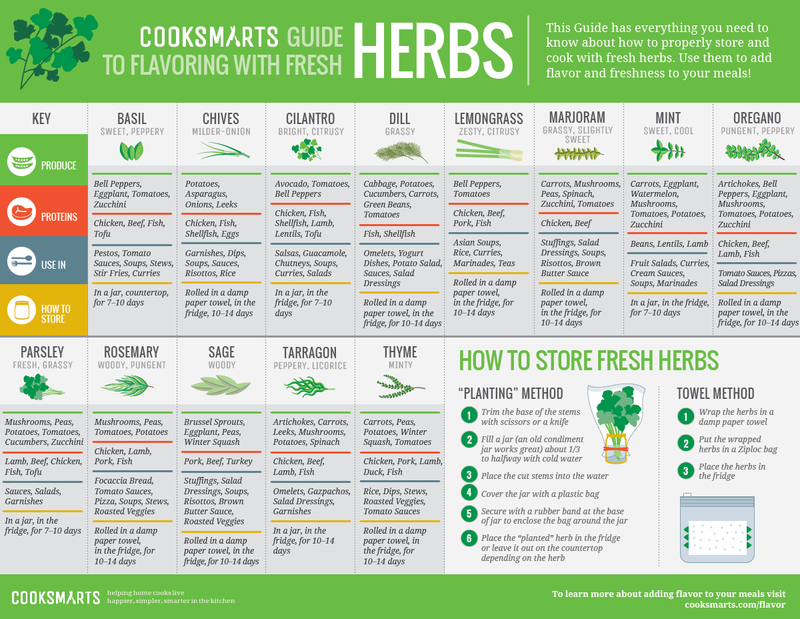 If you find the greens too hot, try cooking them down to cook down the heat a bit, by braising, sautéing, or steaming. This week we have more radishes to add some heat to your salad. For a change, try them thinly sliced on buttered toast, you won't regret it! 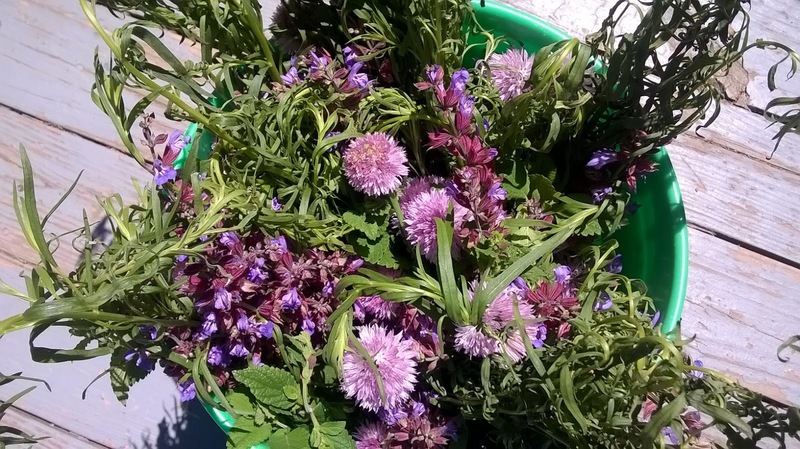 This week we have four herbs for everyone, tarragon, onion chive flowers, sage, and apple mint. 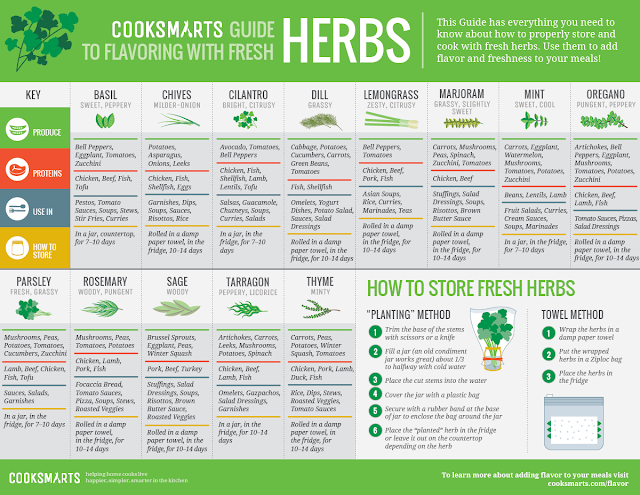 For an idea on what produce, meat and dishes these work best in, and how best to store them, consult the below Herb Cooksmart Guide. Apple mint can be added to water or juice and left for 10 + minutes to infuse their flavor, or they can be dried and made into a tea, or used as a mint in any cooking recipe that calls for them. Sage has the long stalks of purple flowers, which can also be used in cooking for a milder sage taste. We also have the onion chive flowers again this week, divide the flower and spread across your salad for a light onion flavor!